Highly experienced in managing and executing abnormal load movements on site, with in-house jacking and winching capacity for heavy loads up to 250 tonnes. Celtic Recycling has experience and expertise you can trust and has received many commendations for successfully accomplishing jacking and winching operations in difficult site conditions. 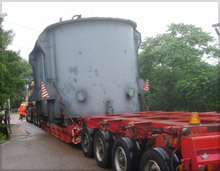 Abnormal load movements present unique challenges and hazards and all site operations require careful assessment, forethought and planning. We would be more than pleased to discuss your abnormal load requirements in detail - for even the most difficult situations we aim to find a practicable solution.